The PADi DSAT Tec 40 course introduces divers to limited decompression diving within accepted recreational depth limits. Although you should take this course in complete Technical diving equipment if you wish to continue on through the PADi Tec 45 and Tec 50, the limits of the PADi Tec 40 qualification allow for more flexibility. Therefore, it is easy to accommodate divers interested in very limited technical diving since the Tec 40 equipment requirements are only a bit beyond the standard recreational kit. If you're interested in technical diving, but haven't yet met the prerequisites for the PADi Tec 50 course, you can consider enrolling in the DSAT Tec 40. It is the first rung in the Tec Deep ladder, the first subdivision of the full PADI Tec Deep course, consists of the first four dives. You will learn to use decompression software and dive computers to plan and make decompression dives with no more than 10 minutes of total decompression and not deeper than 40 metres/130 feet. Use a single cylinder of decompression gas up to 50 percent oxygen to add conservatism to the required decompression. By the end you will be qualified to use a single cylinder of decompression gas with up to 50 percent oxygen (EANx50) to add conservatism to the required decompression. Since it's part of the Tec 50 course, your Tec 40 can credit towards the Tec 45 or Tec 50. You can download it Medical Form Here. 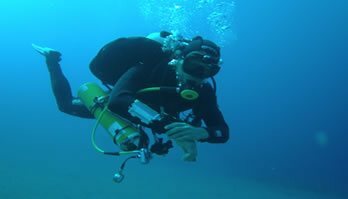 A minimum of 4 dives will be required during the Tec40 course.